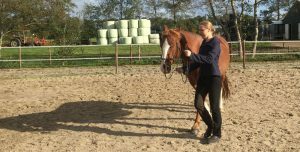 In the basic leading exercises you will get the basics of the body language you will use in all training with your horse. You will find a way of cooperation and you will start paying attention to each other. Lead your horse as if you would take it to the paddock, ie walk forwards and place yourself around the horse’s shoulders. Now you should start walking together and stopping together, and focus on the together. In the leading exersices you stand and walk approximately at the shoulders of the horse. Walking together does not mean you walk away and drag the horse along by pulling in the rein. It means you will both take the first step together, at the same time. 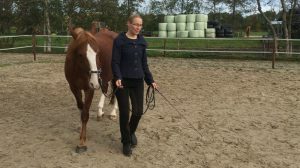 If the horse is slow then use the whip around your back to tickle the horse where your riding leg would be, to get some energy so it will join you. You must clearly demonstrate in your body that you want to go, so bring your point of weight forward and lean slightly to where you want to go. 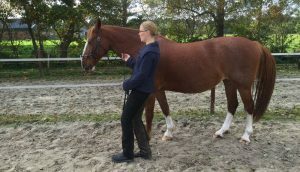 Start the horse by leaning forwards and if needed, use the whip in the leg aid area behind your back. Stop the horse by leaning backwards and if needed, use the whip on the chest. In the beginning it may give you some extra support to walk along the fence/indoor arena wall, if the horse is falling in and out. When you manage to start walking together you also want to stop together. Prepare a halt by breathing out, sink down a little in your knees, lean your upper body slightly backwards and take tiny little steps until you feel the horse is with you, and only then are you stopping, together. If the horse does not want to stop, use the whip on the shoulder, in front of the horse. Do not stop yourself and let the horse pass you, but keep walking and slow down as much as possible until the horse is also in the phase to stop, and then stop together. Important to remember is that in the leading exercises, the rein does not regulate the horse’s speed! To walk away and pull the horse along, or to stop and jerk the rein to make the horse stop only bring along resentment and tensions in the neck of the horse. You regulate the horse’s speed using the whip. Whip on the shoulder in front of the horse slows down, and whip on the horse’s belly increases the speed. You regulate the speed of the horse with your whip hand. When you can start and stop on a straight track along the wall, you can go inside the track and do different figures. For example, do a circle, figure eights, serpentines or any figures you may think of. In order to make these winding figures you must be able to turn your horse to the right and to the left. In the beginning, you have to be extra distinct in the turns. If you go to the left, turn your body clearly to the left, if necessary give a litle impulse in the rein, wait so the horse is joining you and turn together. If you go to the right, you can bring up your whip hand towards the horse’s head and turn your body, wait for the horse to join you and turn. Find a pace in which you both can work relaxed. Turn your own body clearly to the left when doing a left turn. Turn your body to the right and lift the rein hand towards the head of the horse for a right turn. Once you have made a halt you also want to be able to back a few steps. 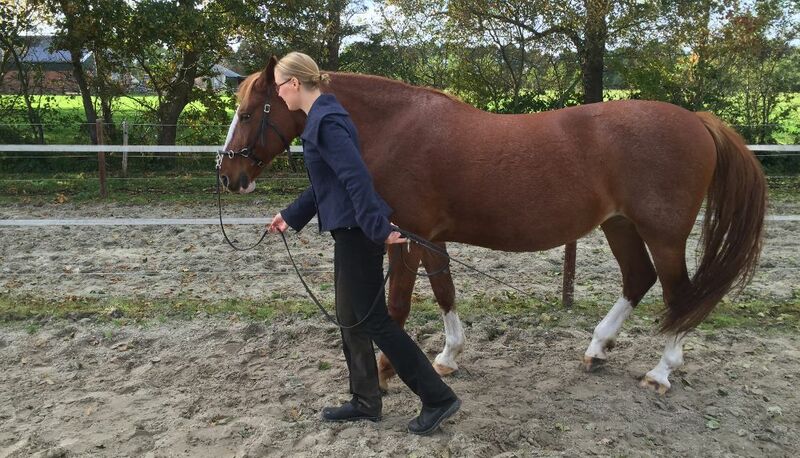 Prepare the horse that you will go backwards by tapping with the whip on the shoulder and take the steps together. Preferably start this exercise next to a wall to back in a straight line. Focus on using your body language to move the horse where you want. In the basic leading exercises you will find your private and common spheres. Both you and your horse each have an “energy bubble” and you must not push against each other, but you should keep an appropriate distance to be able to walk in balance next to each other. Together, you have a joint bubble and this is the bubble to be moved forward or sideways. Focus on using your body language to move the horse where you want. Start together – lean forwards. Stop together – sink down in your knees and lean backwards. The whip regulates the speed if your body language is not enough. Increase by using the whip on the belly. Decrease by using the whip on the chest. Do not hang on each other. Respect the personal spheres of each other, but also create a common sphere.